With The Maids, Jean Genet set his seal as one of the most iconic playwrights of the 20th century. With its hallucinatory text and gender-swopping transformations, The Maids also became a forerunner of the extraordinary phenomenon of `drag’, so influential culturally over the past half century. 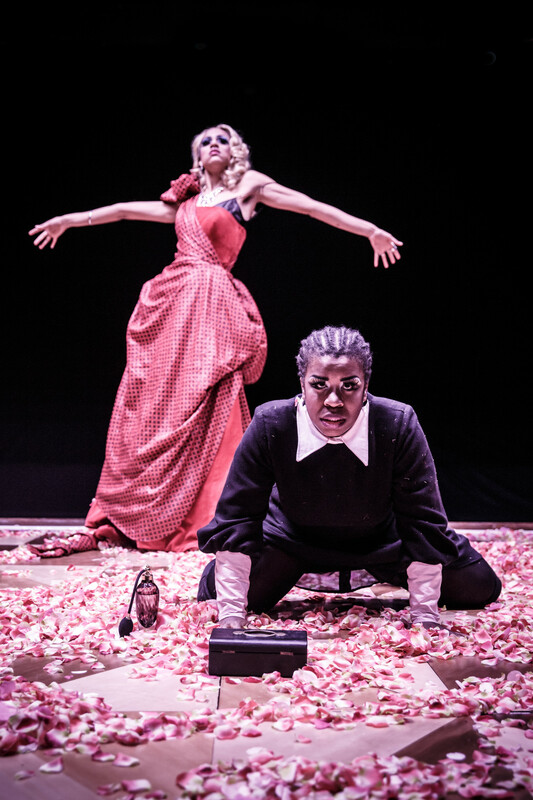 Initially to be played by men as an exploration of among other things, power relationships, sado-masochism and fantasy, Jamie Lloyd’s production at Trafalgar Studios doffs its hat to two current zeitgeists – gender equality and racial divides. 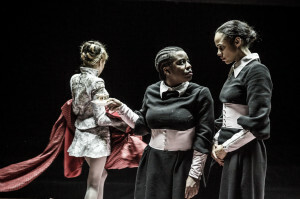 Hard on the heels of the Oscars `racist’ debate, Lloyd’s production features two women in the leading roles of the maids, Solange and Claire – African-American Uzo Aduba and British born Zawe Ashton with `Downtown’s Laura Carmichael as a rich, white mistress, both adored and detested by them. In fact, American playwright Wendy Kesselman re-sited the two maids in My Sister in this House (1981), an all female version which explored the same real event that inspired Genet’s play but from a more socially realistic point of view. 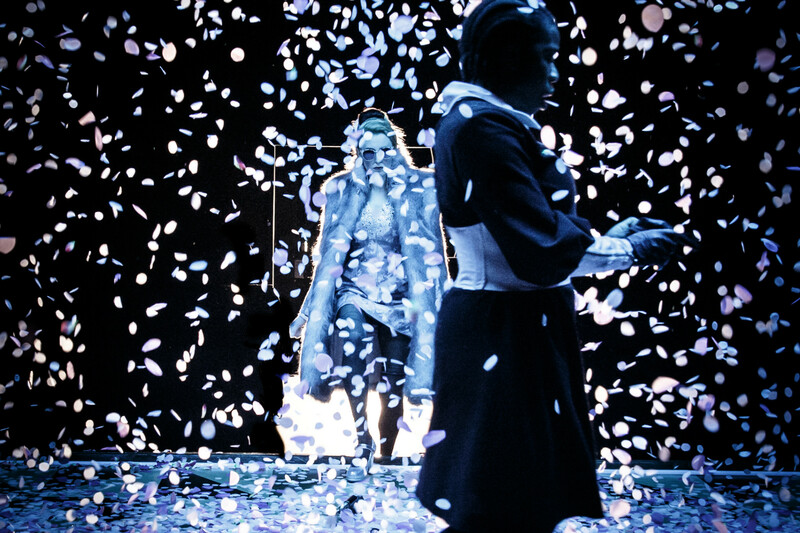 Lloyd’s production with its translation by Australians Benedict Andrews (of the Young Vic’s Three Sisters and A Streetcar Named Desire fame) and Andrew Upton (the NT’s The White Guard and Philistines) returns to stylisation – Soutra Gilmour’s picture framed box, bedecked in flower petals within which Aduba and Ashton go the rounds watched by we, the audience, on both sides. Ever aware in theatre, as in life, of performance and mask-wearing, Gilmour’s design captures its author’s aesthetic in a production defined by its studied camp, in which Claire’s initial assumption of her mistress’s role is played out by Ashton as a female drag queen. Ashton is the real deal. And magnificent. She can play outrageous, extravagant and softer tones. Uzo Aduba as the older sister, Solange, complements her with explosive power and comic force. To watch her gearing herself up under a prepared whiplash of insults is to watch ritual and humiliation coalesce into a volcanic eruption of violence – the resentment of years of servitude breaking out transformed by ritualised performance and love. 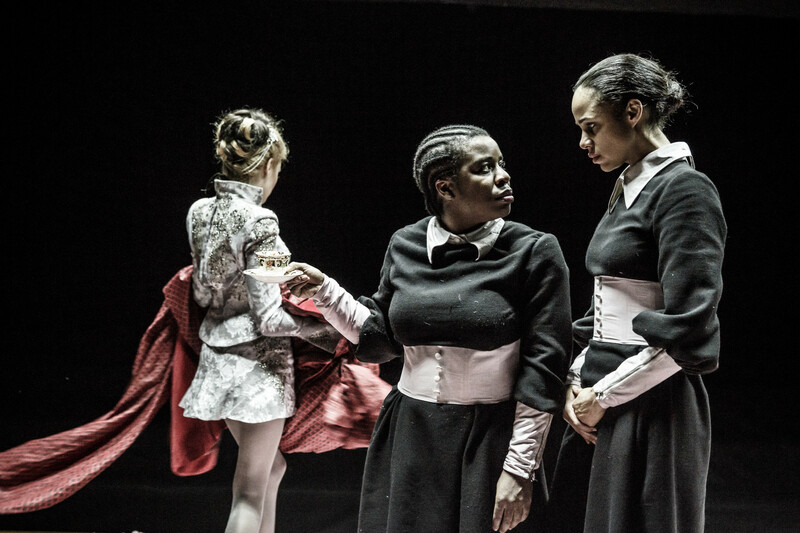 At its worst, over-written, The Maids is still an extraordinary expression of pain and suffering, desperation and hate transmuted into beauty. Lloyd does it proud, if noisily! This entry was posted in 2016, Reviews and tagged Andrew Upton, Benedict Andrews, dominance and class, female drag queens, Jamie Lloyd, Jean Genet, Laura Carmichael, power relationships, race, Trafalgar Studios, Uzo Aduba, Wendy Kesselman, Zawe Ashton on March 3, 2016 by Carole Woddis.